When I moved to rural Mississippi from downtown Los Angeles, I knew I was in for environmental shifts beyond just the absence of Starbucks. I was prepared for politics-by-immersion and religious dogma different from anyplace I’ve ever lived. And I knew about the climate down here; after all, there’s humidity in Mississippi. It was a surprise, however, to realize just how many churches there are. A couple of friends have said it’s because when squabbles arise among congregants, it’s S.O.P. for one faction to break off and start a new church. Squabbles apparently abound, judging by the number of churches. Simple math says that some of them can’t have more than a handful of members. It was also a surprise to learn that there are so many bad drivers in Pike County. They’ll sit behind the line while waiting for left turns, which sometimes means nobody gets through the intersection. They’ll drive 20 miles below the speed limit on dry, sunny days. They don’t use turn signals. They are oblivious to the concept of using Interstate highway on-ramps for purposes of acceleration. And they’ll drive around with their high-beam lights on, ignoring flashed-light pleas for dimming. “You aren’t gonna tell me what to do,” I sense them thinking. But nowhere has the getting-used-to been as challenging as the culinary realm. Coming from a place where it was rare for a supermarket to have fewer than a dozen kinds of lettuce, my Mississippi life has meant sacrifice. One of the first signs I was in for a struggle was a shopping list that included leeks. I forget the dish for which I needed it but I make Julia Child’s Potage Parmentier now and then so it could have been that. At my first stop, the man in the produce department didn’t know what a leek was. At the second store, the man said forlornly, “We used to have those but nobody bought ‘em. Try Walmart.” At Walmart there was no produce man or woman to be found, and neither were there any leeks. I recall substituting a mix of yellow onions and the green parts of scallions and crossing my fingers. People share recipes a lot on Facebook. And of course churches and clubs issue cookbooks of their members’ recipes. A cursory scan of them reveals a code word that jumps out again and again. You’ll see Rich Cheesy Cheesecake, Extra Rich Sunshine Muffins, Super Rich Chicken ‘n’ Dumplins, and Grammy Soo’s Extra Double Rich Rich Pound Cake. The fat will arrive in different forms depending on the environment. For chicken ‘n’ dumplins, for example, it comes in the form of margarine, aka oleo, deposited in the bubbling liquid along with the main ingredients. “For extra richness, add a stick of margarine to your broth,” the Shady Glade Spiritful Hosannah Country Church Book of Brighter Day Recipes will advise. The result is, depending on your persuasion, a manna-like concoction sure to induce choruses of “Mmmms” or a shimmering pool of yellow goo floating atop molten library paste. There is a limit to our ability to pinpoint the meaning of richness modifiers like extra, super, monstrously, sinfully, crazy and hella, but they have all been added to “rich” in recipes at one time or another. We have also come across Ungodly Rich Cupcakes, but while our recollection is hazy on the recipe’s origin we suspect it is one of the secular recipe compendia, such as from the Junior League, and not a church cookbook, unless maybe from Episcopalians or other kneelers. Another area of culinary surprise for me in Mississippi was the way some people seem to like their scrambled eggs. “I’ve heard that, but I like my scrambled eggs creamy and silky and dense,” I said. The question threw me. While there is not always a wide variety of cuts to be had, the handful of supermarkets always have at least a few kinds of steak and roast. Store X tends to have the best beef overall, which is a surprise since its pork is injected with solutions of various chemicals (“to enhance flavor,” the label says unironically). Store Y has OK beef and pleasant employees but only a few cuts of meat, and I like choices. Store Z, you have to watch out for, because they have this naughty habit of packaging beef so the out-facing side is beautiful and enticing but the underside, which of course you only see after you get home and open the package, is a tangle of connective tissue and other undigestible matter. There is a Store W but I’ve never shopped for beef there because it’s across town. I explained all this to the woman who asked about my beef-shopping, but I had misunderstood the question. She asked where I get beef because she thinks it’s hard to find at all. “Huh? Everybody has it,” I said, incredulous. “I can never seem to find it,” she replied. It occurred to me at that moment that she is probably one of the same people who don’t know any better than to wait behind the line when they want to turn left. It is not the revelation of a secret, since I’ve said this in public, but I don’t care for pulled pork. Every restaurant around here sells pulled pork, and everybody but me seems to like pulled pork, but pulled pork seems to me a copout among meats, since there’s so little to do except keep a fire at a certain temperature and wait. I suppose there’s an art to that part, but once the meat is cooked it’s just, well…pulled apart. Maybe my underappreciation for pulled pork has to do with my Texas upbringing. In Texas, barbecue means beef, and beef is what we cooked and ate. Daddy would cook beef ribs on the grill, and I loved gnawing on the giant things. And every couple of weeks we’d have steak. It was always T-bone, and Mama broiled it in the oven. She knew how to season steak, and I liked the way the rim of fat turned crispy under the heat. I’d eat the fat by itself before getting into the meat but I don’t do that anymore. 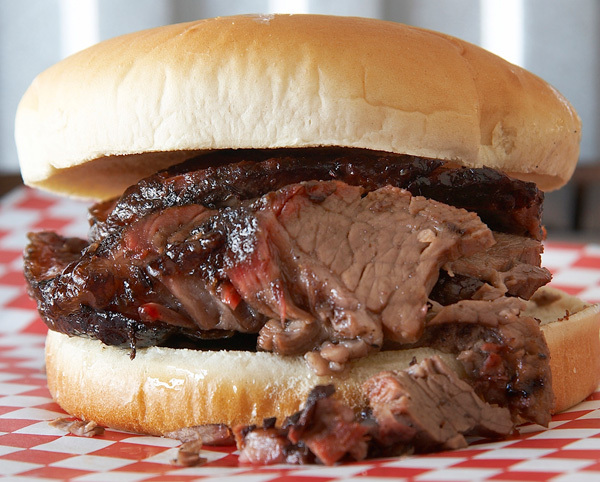 We got our brisket in restaurants, and I liked it sliced or chopped – didn’t matter. It still doesn’t, and I’m not a snob where brisket is concerned. But I just don’t get pulled pork.